Hello friends, Whenever you are thinking of building a high-end CPU to play games. You generally think about only the main parts such as the RAM, ROM, graphics or cooling. They build or brought up the PC by seeing this feature and later on they have to regret their choice. Have you ever thought a good paste is essential for the cooling of the processor? The answer is yes! a thermal paste is essential for the cooling process. The good quality of thermal paste better will be the cooling process. These are the smallest factors which you ignore during the CPU building and therefore decrease your performance of your CPU. If your thermal is not of good quality then processor might heat up fast creating problems like system lagging, automatically shutdown itself. Since the processor is not working properly and in several cases it might get damaged. In this article, I will give you information about the thermal paste, uses and the best thermal paste for your CPU. This will help you a lot if you are confused which thermal paste is best. Since all the thermal paste has their own characteristics and uses. Also, the reason why thermal paste is used because when you go for overclock then a lot of amount of heat is generated. To cool down the processor or maintain the temperature of the processor thermal paste is used along with the heat sink. Now read the article carefully and all the doubts about the thermal paste will be clear to you. Since many of the people who are dealing with CPU hardware have knowledge about this. But if you are a rookie and going for the market to buy thermal paste but you will be confused because there are a wide variety of thermal paste. If you don’t have a piece of knowledge about the best thermal paste then you will buy any thermal paste and later on you will regret your decision. For the people who do not what is Thermal paste? The Thermal paste is thermally conductive paste which is used between the processor and the cooler’s heatsink so that the temperature of the processor remains low. During the normal work, the processor does not excessively heat up and works normally. But when you play a game or editing a video or streaming online then your processor should be powerful. The more or heavy work is done the more will the processor gets heated up. That’s why we use thermal paste and heat sink cooler to cool the processor. You have seen some CPU which are dedicated to purely gaming have water cooling system to drop the CPU temperature. The work of the thermal paste is to maintain your CPU temperature to the functional limit. If it crosses that limit there is a chance that your paste gets damage and stick to the processor. Whenever it comes to use a thermal paste on a processor you think that more the thermal paste greater will be the conductivity. If are spreading the paste with that mindset then you are wrong. If you are using a thick layer of thermal paste between the heat sink and processor then the thermal conductivity of the paste decrease. It also affects your processing speed and cooling will not take place properly. If you are using a thin layer of thermal paste then it has the good thermal conductivity and the temperature of the processor will remain constant. The procedure to use thermal paste is shown below since it is very delicate work so read the steps carefully. Firstly, you need to bring up the right thermal paste according to your CPU configuration. You need to buy them if you have knowledge about it otherwise learn about the thermal paste properly then go for buying this kind of item. Before buying check the thermal conductivity, bearing temperature etc. are the fulfilling your requirement or not. Now put a small amount of paste on the Processor and spread it evenly with the help of plastic sheet or anything else. Make sure not to put the extra paste on the Processor as it makes the layer thickness which reduces the thermal conductivity. Hence more heating of the processor will take place. Do not spread the thermal paste with your finger as it will spread unevenly and create a lot of problems. The problems will be heating your processor quickly or your CPU will lag during the operations. In some of the cases, the PC is shut down on its own. Now put the heat sink or cooler on the top of the processor and you are ready to use your CPU. I’ve told you in the above part what is a thermal paste, How to use and its characteristics. Now I will tell you about the best thermal paste available in the market for your CPU. One of the best thermal paste for your CPU if you are want to overclock your CPU. 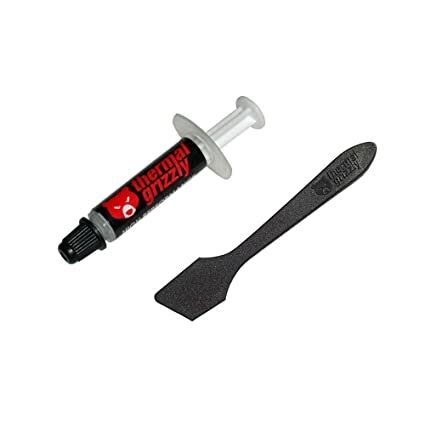 Since the overclocking process generates a large amount of heat so it requires the best thermal paste to overcome that amount of heat which can be done using Thermal Grizzly paste. The thermal conductivity of this paste is about 12.5 W/mk which is best if you are going for overclocking. The bearing temperature at which the paste dry out is 80-degree Celsius which is pretty high. 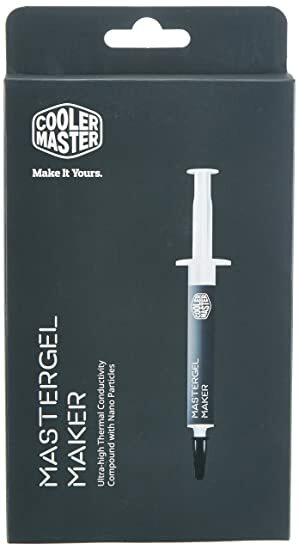 If you are going for going for a high-end CPU for gaming purposes my recommendation is this paste. Since this paste has a higher amount of thermal conductivity that’s why it is famous among most of the gamers around the world. If you want to overclock your K series CPU then this thermal paste is best suited. The reason to use this on the K series because of its temperature bearing capability which is the most effective and high. Also, the use of nanoparticles technology which is capable of handling different temperatures. The temperature bearing capability of this ranges from -50-degree Celsius to 150-degree Celsius. The thermal conductivity of the paste is about 11W/mk which is good. Even at the lowest temperature, it can work fully functional. The viscosity of the paste is good that’s why it spread easily on the CPU. Also if your paste gets dry out you can replace it without damaging any of the CPU an heat sink parts. Check out HOW TO ROOT ANDROID WITHOUT PC? If you do not want to go for overclocking of your CPU then this compound is best. 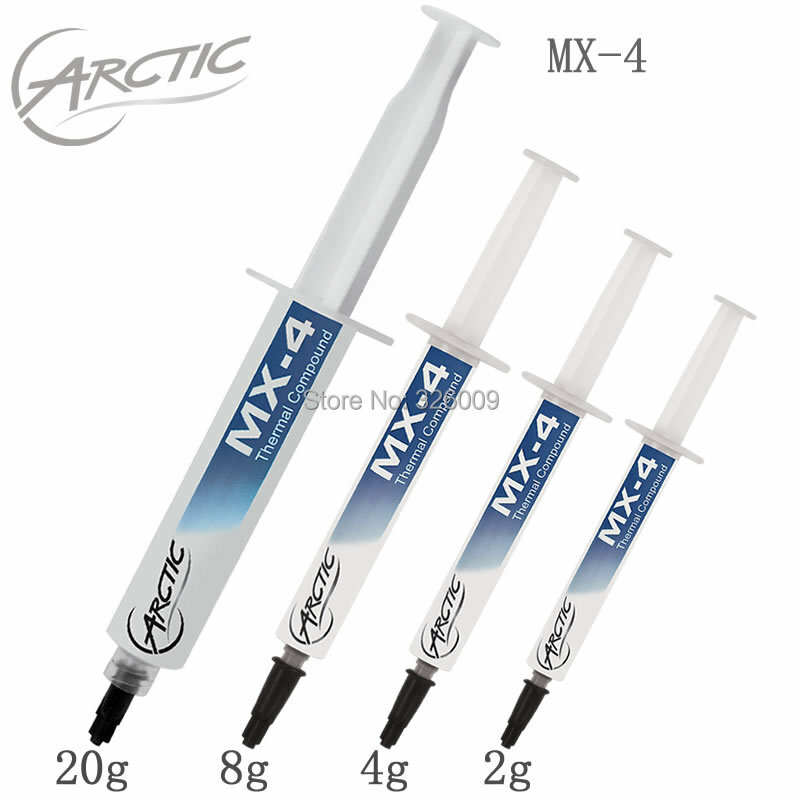 The thermal conductivity of the Arctic MX-4 is 8.5 W/mk which is less but can be used for normal purposes. If you are going overclock for some time period then it can handle but for a large time, it can damage your CPU. As you can see the conductivity of the compound is less in comparison to other paste. so, it can be used for overclocking for some time period. One of the greatest features is that it has very low thermal resistance. It means the transferring of heat will take easily from the processor to cooler via thermal paste. Another feature of the thermal paste compound is Non-capacitive, Non-corrosive as well as Non-bleeding. One the best thermal compound for the CPU as well as GPU. You can use this thermal compound to reduce the temperature of the PC. 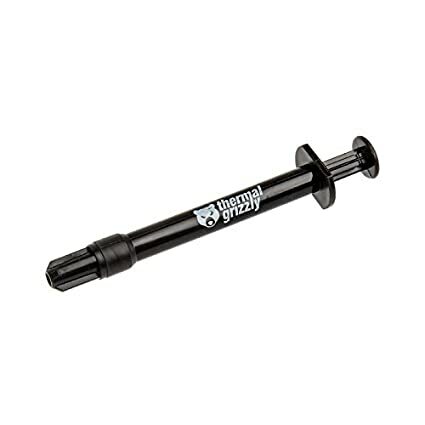 The compound is good quality in terms of durability and usefulness. 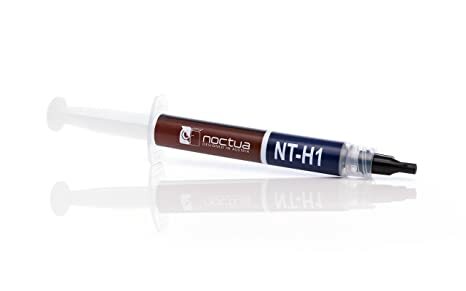 One time usage of the compound works for at least five years this is guarantee given by the Noctua itself. Also, the feature of this compound is that it is non electrically conduct and non-corroding thermal grease. Sometimes happens when the electric current flows through it which do some damage to the processor and heat sink. So the use of this compound will reduce the chance of short-circuiting and it is safer to use with all kinds of heat sinks. The bearing temperature of the compound lies between -50-degree Celsius to 110-degree Celsius. The reason to use this kind of thermal grease if you are going for extreme overclocking. The thermal grease is a liquid metal thermal compound us made up of the eutectic alloy. This compound is a mixture of other various metals such as tin, gallium, and indium. The thermal conductivity of this grease is very high and the long term stability of the compound. The bearing temperature of this kind compound is very good i.e. from 10-degree Celsius to 140-degree Celsius. The thermal conductivity is about 73W/mk which is quite large in comparison to other such as coollaboratory liquid ultra thermal compound. One piece of advice before using this compound is that do not use the thermal grease with the aluminum heat sinks. I give this thermal compound the value of money because this is the compound which has all the features of the liquid metal thermal compound. It is made up of 100% liquid metal compound which has good thermal conductivity. Phobya liquid metal compound does not contain any non-metallic additives such as silicon or metal oxide. The one time use of this compound can last up to 5 years or more. By using this thermal compound you can increase your conductivity ten times of the standard compound. This thermal compound has a thermal conductivity of 8.5 W/mk. The density and viscosity of this compound are good but not as the Thermal Grizzly Conductonaut. The one time use of this grease can last up to the 3 to 4 years. This type of compound can be used in normal CPU where overclocking is not done frequently. But this compound can work better in an overclocking period but not at extreme overclocking. The compound is non-toxic, non-corrosive, non- curing, non-bleeding and user-friendly. This thermal compound should not be used with aluminum heat sinks because of its corrosion properties. So, friends, I hope you understand the use and need of the thermal paste. Every thermal paste has their own characteristics. You have to know about your requirements before buying the thermal paste. Also, put the right amount of paste on a processor so that heat flow will be fast. From the above best thermal paste which would you like the most and recommends for your CPU tell us below in the comment section. If you like this article then share with your friends who are thinking of buying a PC. This information will surely help him to get the best one. If you more information about how to build a PC dedicated to gaming then comment down below and we will surely help you.